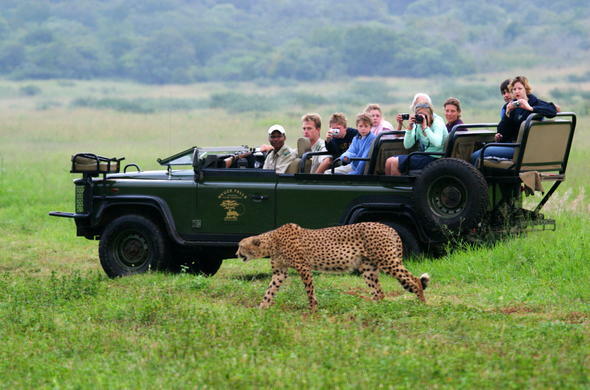 Just 4 hours drive (approximately 335 kilometres) from Durban, Mkuzi Game Reserve lies between two rivers at the foot of the Lebombo Mountains. This 40 000-hectare reserve forms part of the Greater St Lucia Wetlands Park and, situated on the Maputaland coastal plains, Mkuzi is a favourite haunt for nature lovers. It supports a population of about 120 White Rhino, and some 70 Black Rhino as well as Elephant, Cheetah, Warthog, Leopard, Hyena, Giraffe and a variety of other plains game. Prolific herds of Zebra, Blue Wildebeest, Impala and Nyala can be seen as well as Kudu, Eland and the little Suni Antelope.The reserve is renowned for its birds, with 600 species having been spotted here. Six superbly placed hides offer fantastic birding, as well as the chance to watch game coming to the water holes and pans to drink. The pans are shallow expanses of water surrounded by a haze of fever trees and reeds and in the summer they are lined with water lilies.Nsumo Pan is the larger with two elevated bird viewing hides. Guided day and night game drives can be booked at Mantuma Main Camp office and if you prefer a more intimate experience of the African bush, guided walking trails are an option. Accommodation within the reserve is varied. A caravan and campsite are situated adjacent to the Emshopi entrance gate and the Umkumbi Tented Bush Lodge is near Mantuma Main Camp and is situated in the controlled hunting area.Nonhlela Bush Lodge lies on the edge of the Pan by the same name and there are also self-catering bungalows, rest huts and a beautifully situated self-catering tented camp adjacent to Mantuma Main Camp. There is also a small cultural village to visit where traditional Zulu crafts are sold. There is a slight malaria risk.